Prisco manufactures aqueous coatings in our “state-of-the-art” ISO 9001:2008 certified facility in Charlotte, North Carolina. The unsurpassed quality of all products is assured through certification of all incoming raw materials and laboratory quality assurance of all finished products. With over 100 technical field representatives throughout North America, Prisco is well positioned to provide on-site support for all coating products. Prisco aqueous coatings are available in a number of high gloss, satin and matte finishes. The Q1000 series for two-sided application is available in a wide variety of gloss finishes, drying speeds and slip characteristics. Most formulations in this series allow for over-coating of UV coating, oil based varnishes and aqueous coatings, permitting spot coating. Other formulations allow for application of film laminates, hot foil stamping and laser imprinting. The Q2000 series are designed for folding carton and other single-sided applications. This series has been developed to provide excellent hold out when applied to CCNB, SBS and other types of folding carton stock. Formulations are available for specific slide angle requirements and specific rub- and scuff-resistance levels. 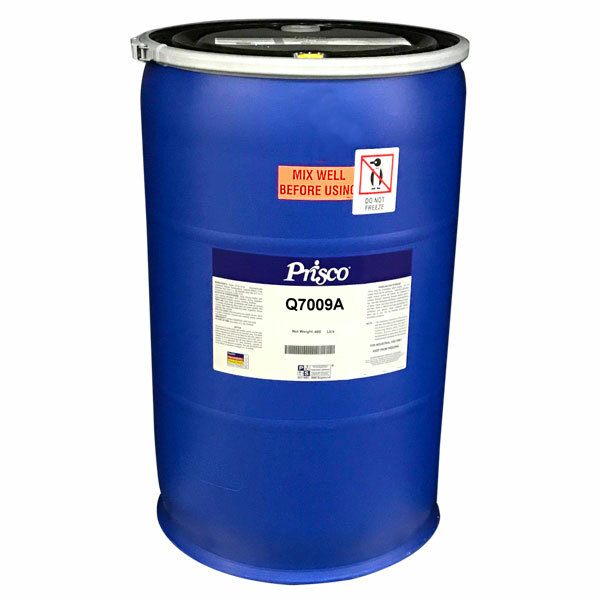 Some formulations within the Q3000 series are specifically designed for single-sided primer applications and others are designed for work-and-turn primer applications. When compared to standard products, these coatings form a film that has an enhanced ability to accept UV coatings, film laminates, oil-based varnishes, or aqueous coatings. Within this group of matte coatings is the new “Streakless System.” Utilizing unique raw materials, this group of matte coatings has unmatched leveling qualities that eliminate film imperfections and streaking. All of the coatings in this series are pencil-receptive. The Q6000 series covers a wide range of specialty coatings including: low- and non-curl, blister-pak, “writeable,” nonabsorbent substrate and those with resistance to alkali materials, moisture and extreme heat. This series of coatings is specifically designed for in-line coating on heatset web and flexo presses. Within this series are gloss, matte and satin coatings, all designed to produce even, fast drying film formation over a wide variety of inks and substrates. Specific products in this series are designed to control rub, slide angle and chemical resistance. The Q8000 series of coatings are designed for in-line application of coating through the ink train of the last printing unit. This gives any sheetfed printer the ability to substitute aqueous coating in situations where oil based varnish would traditionally be used. This series includes both single-sided as well as work and turn products, available in gloss, matte and satin finishes. The series consists of aqueous gloss, satin and matte finish coatings that are specially formulated to eliminate VOC’s while maintaining superior performance. These coatings are a perfect complement to a comprehensive program to lower VOC levels in the pressroom. Packaging – Prisco coatings are available in various packaging formats as well and can be supplied in bulk. Standard packaging includes: 265 lb. plastic drums, 480 lb. plastic drums and 2350 lb. totes.